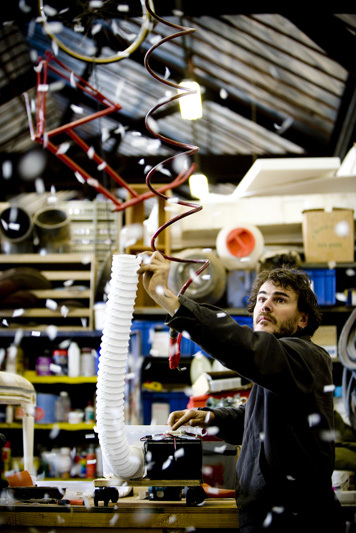 Sourcing 1960s home furnishings, repairing vintage chainsaws, fire-proofing thousands of dead leaves and making a coffin are just some on the tasks that have lately been on the very long to-do list for STC's Head of the Props Department Alex Stuart. 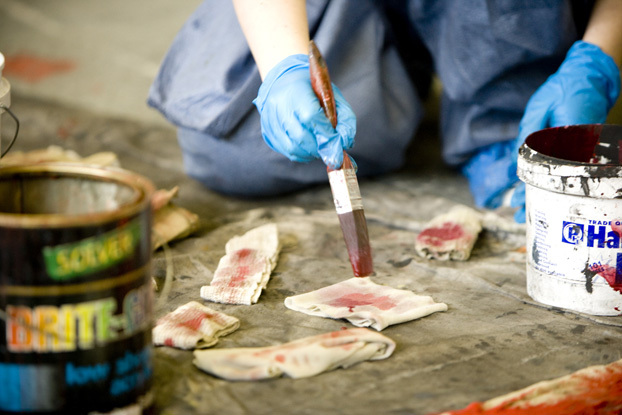 The STC productions Blood Weddingand Lootwere created in the company workshops, so Stuart and his small, hard-working team were put to the test. It was nothing new for the department, who work closely with the set construction, sound, costume and lighting departments to make the visions of set and costume designers attached to each show a reality. Stuart, who has been with STC for almost a decade and head of department for six years, describes his area as "broad ranging". "We pick up the slack," he says. "I find a lot of things that come up in a production that no-one wants to deal with get thrown my way, a lot of the tricky effects and such, so there's a lot of problem solving." This means anything from furniture or loose items, kitchens or cabinets, lamps or musical instruments can fall to the props department. Sometimes shows demand they think outside the box, such as when they were asked to create topiary swans for The Way of the Worldin 2003. The solution was both simple and clever: they ended up covering models in popcorn and spraying it green. "They looked really good and it was probably a bit left of centre," Stuart says. "But I wouldn't do it again because we had problems with pigeons back at the warehouse." 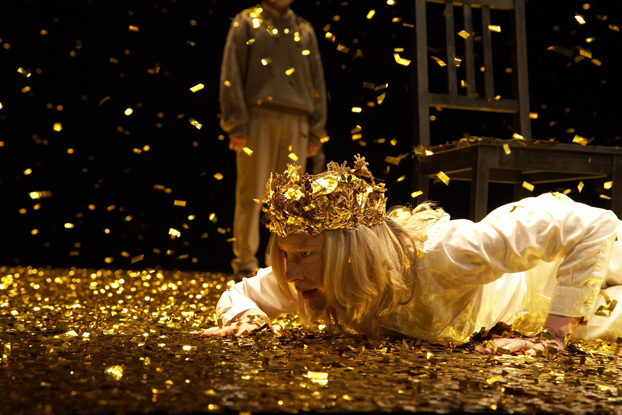 One of the most challenging productions to date for the department was The War of the Roses, which required machines to drop a stream of gold confetti on the Sydney Theatre stage for more than an hour. "Although there wasn't a lot of stage or props in that show, the whole confetti thing was thrown, by default, into my basket and it was a very difficult technical thing," says Stuart. "There was a lot of trial and error in that show, and we started off by workshopping lots of different ideas for how these machines might work. From this we built some prototypes and figured out which was the best direction to go, because it had never been done before, dropping that amount of confetti for that period of time." Stuart and his team clearly relish the challenges thrown forward by each new production and they pride themselves on achieving the designer's vision as closely as possible. However this can also make for a highly stressful work environment. "There was a lot of pressure and scratching of heads with The War of the Roses," he says. "If the props didn't work, then the show didn't work." 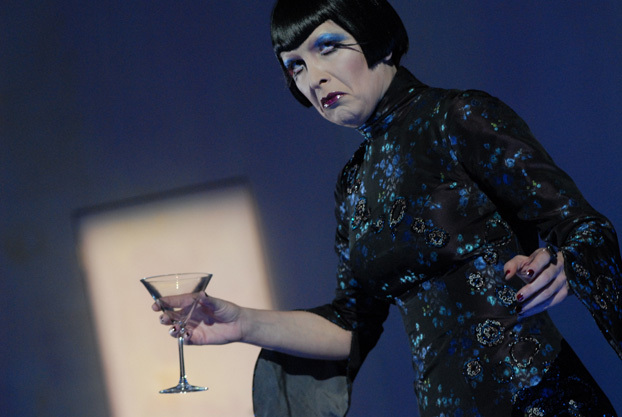 Another challenging production for the props department was the eight-hour Barrie Kosky directed epic The Lost Echo, which required an unprecedented number of props including motor driven items, blood, sleight of hand tricks and bits of furniture that performed unusual functions. Despite the challenges, Stuart counts it as one of his favourites to work on. "That was a good show, so big and expensive and so many different things in it," he says. "It didn't seem overwhelming to me because it was such an engaging process." Not all shows are so demanding, and for most productions the majority of the items on stage are bought rather than made. Often making the items look as realistic as possible is a key priority, which is why real food is often used in performances. In the recent production of The White Guard, Stuart chose to install a real cut Christmas tree as it had a better "look and smell" than a fake one and, despite the stage lights, it surprised everyone by lasting five weeks in a bucket of water. For the production of Loot, his team found many of the 1960s period props and set pieces in op-shops and auctions. "Most shows are fairly straightforward, mostly furniture, so a lot of buying goes on," says Stuart. "Usually we start by looking for the objects the designer has asked for but if we can't find it, or we know that because of the size of whatever that we won't find it, then we'll make it here." 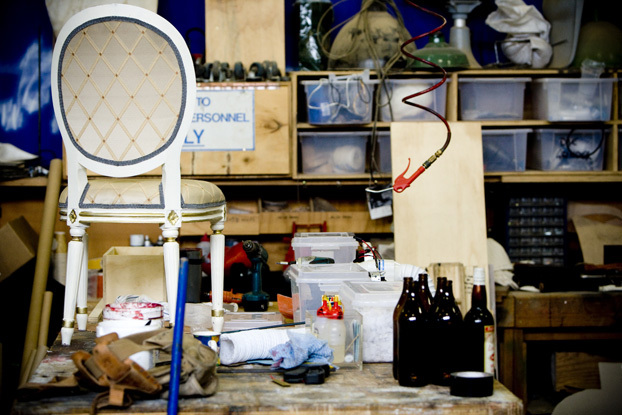 Of course, prop items from past productions are often reused, particularly since STC has committed to the Greening The Wharf program, which encourages all of the workshops to recycle materials as much as possible to reduce waste. "We have quite a bit in storage," Stuart says. "You can never have too much, and we have heaps of stuff at our warehouse, but only a limited amount of room so it's sometimes a toss up about what we keep or what might be useful later on. Once a show is up and running, the bulk of Stuart's job is done but he is never quite able to walk away, as changes or problems with the props during the season run must be dealt with promptly. "Sometimes you get two weeks into a show and things shift, and it becomes apparent that a particular prop is not working for stage management and we need to come up with something simpler," he says. "There are lots of back up plans."